Preheat your oven to 170°C and place 12 cupcake cases into a muffin pan. Whisk the Plantation Select sugar and eggs together until pale and creamy. Add the vanilla extract, sunflower oil and milk and mix in. Sift the flour, corn flour, baking powder, salt and cocoa into the bowl. Whisk until everything is combined. Divide the mixture between the cupcake cases. (Depending on size you may have enough batter for an extra cupcake.) Bake the cupcakes for 20 minutes, or until an inserted skewer comes out clean. Set aside to cool completely. To make the icing: use an electric beater to soften the butter. Sift in the icing sugar and cocoa, and beat until everything comes together. Add the milk and beat again until you have a soft, spreadable icing. Spread the icing over the cold cupcakes, making a small hollow at the top of each cake. 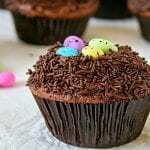 Sprinkle vermicelli around the edges and fill the hollows with candy eggs.